The Internet has been out all week:(. Will be back as soon as it is up and running again! If you are a child of the 80's (and for that matter probably any mom of the 80's) you just got a smile on your face. To say my mom got carried away with puff paint when I was a child might be an overstatement (but not by much, sorry mom). I think I probably had a shirt embellished with puff paint for every day of the week. 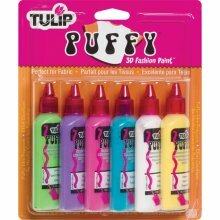 I remember I even had several pairs of tennis shoes decorated with puff paint. I will say though, she is not the one to blame, I loved every t-shirt, sweatshirt, dress... she made me! 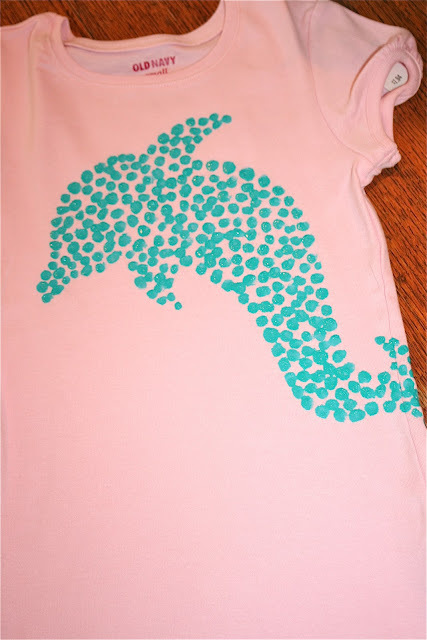 So, when I saw this post on Ruffles and Stuff for a Faux Sequin t-shirt, I knew I had to try it! 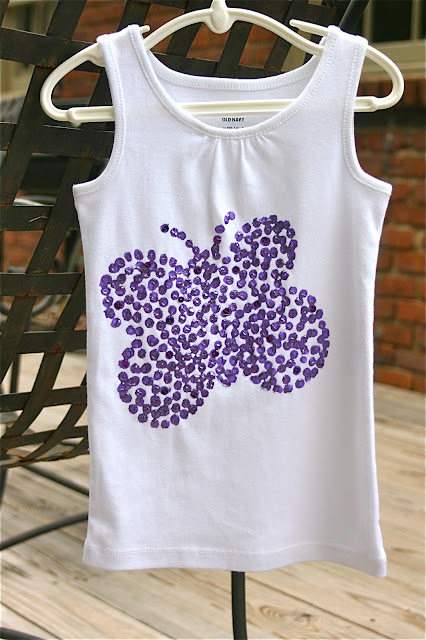 This is really in honor of my mom; all those puff paint shirts you made me, I am now making them for my daughters. Hopefully they will love them as much as I did. What initially got me excited about this t-shirt (besides how cute it is and all the possibilities) was how easy it would be to make with Ella (and Miller). Ella had two birthday parties coming up and I thought these would be perfect gifts. 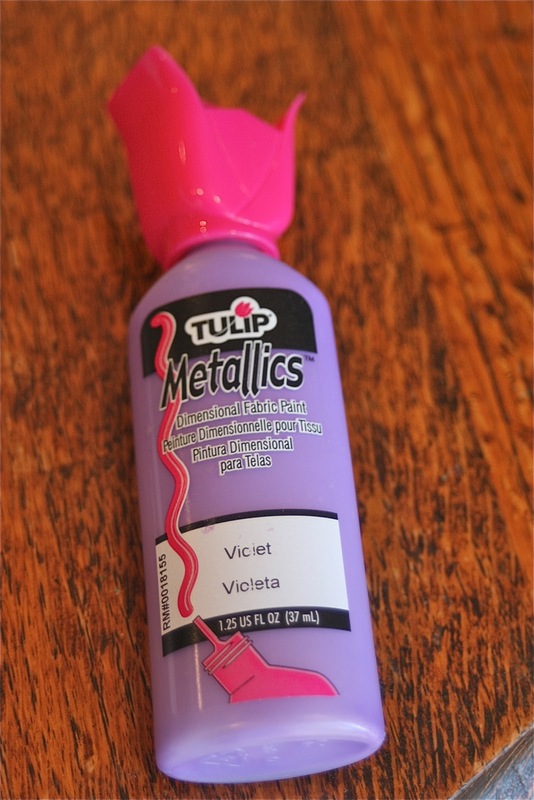 So you don't make the same mistake I did, make sure you get the Metalics puff paint. I accidentally did not get the Metallic in the aqua paint. It still looked really cute, but would be even cuter with metallic paint. I ended up adding a lot more sequins to it to help give the effect. 1. Draw your design (honestly for me this is the hardest part! I am NO artist. 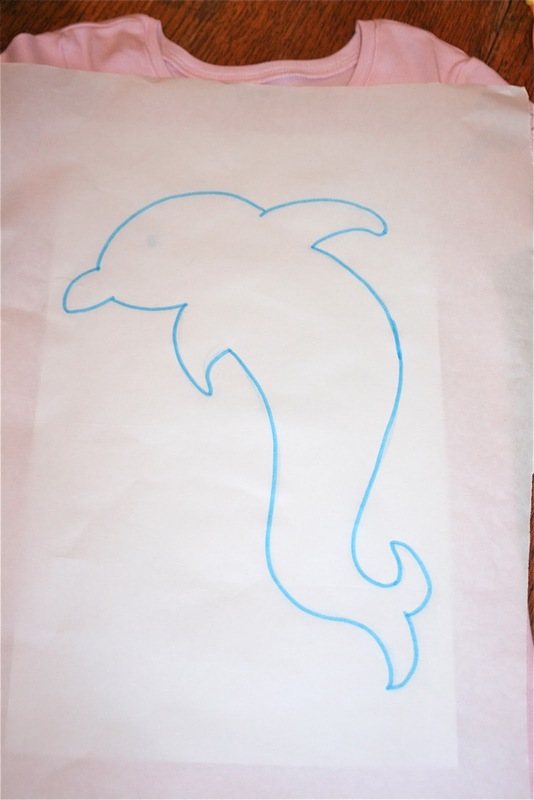 It probably took me at least 30 minutes to get a dolphin that I was somewhat happy with. You could always use a picture from a coloring book if you really feel like you cannot draw the picture you have in your mind). 2. 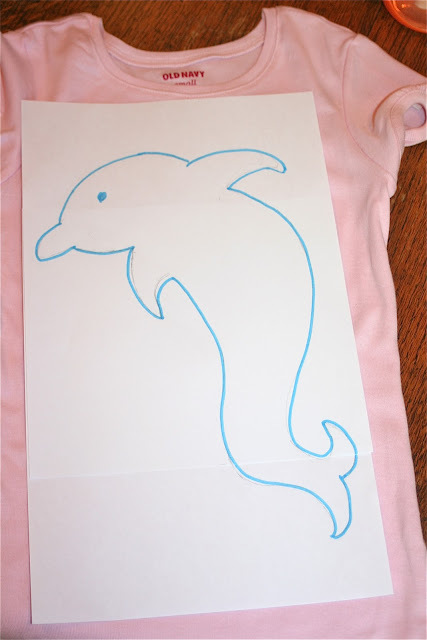 Then trace your design on freezer paper. And cut out the dolphin. Freezer paper is the best! If you do not have it in your sewing room, you need to go to the store today and get it. 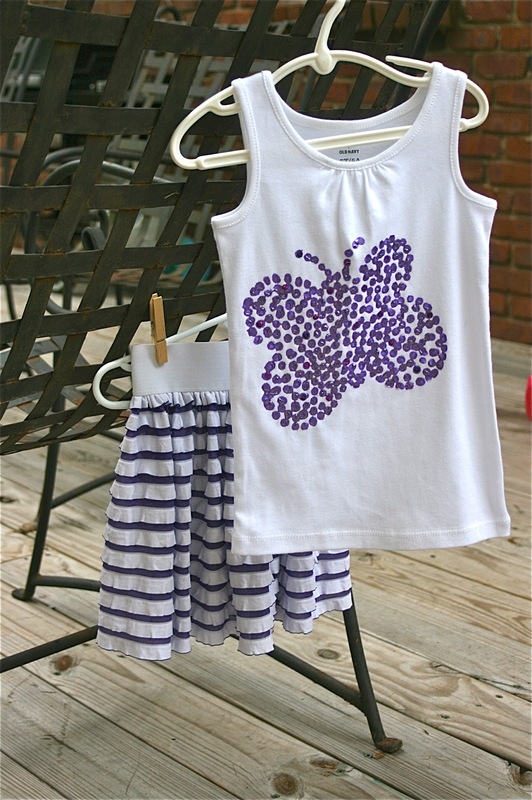 It irons on fabric (perfect for tracing patterns and cutting out fabric, appliqués, stencils...) and then easily pulls off. 3. Iron the template onto the t-shirt. I wrapped the dolphin around the t-shirt. In hindsight, I wish I would have wrapped it around a little bit more. 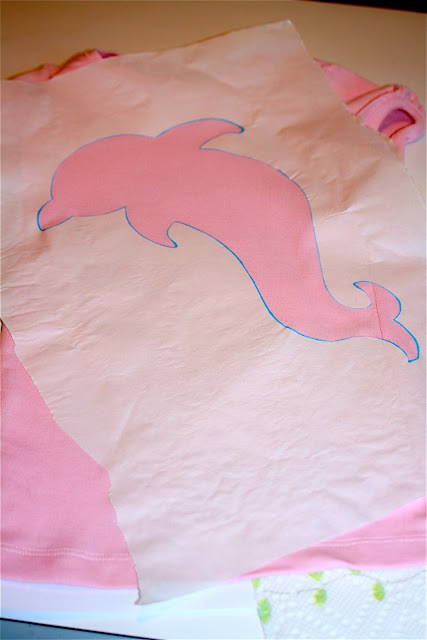 Make sure the template is ironed on really well around the edges so that no paint seeps under. 4. Dot the paint on the t-shirt. 5. With the eraser, press down the dots. Miller loved doing this just as much as Ella. I will admit, it is instant gratification! Here is a closer look of what it looks like with metallic paint (don't know why the color is so funny). 6. For an added touch, you can sew sequins throughout the design. Miller was so proud of what they had created. 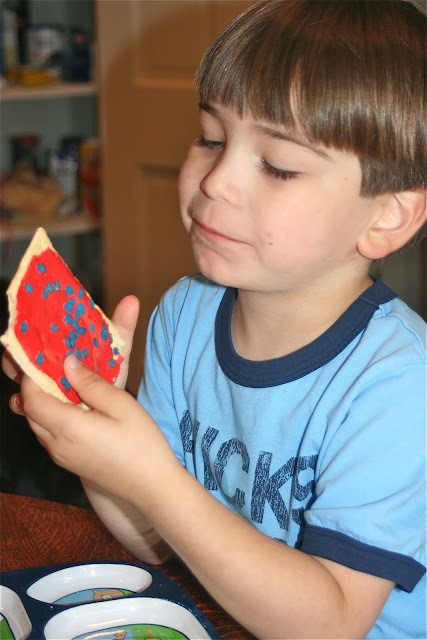 He knew how much their friend would love it. What little girl would not be thrilled to wear this??? And I really promise you this, if you do not take forever to draw like me, you could pop one of these t-shirts out in 30 minutes. If you decided to add sequins (it is very cute without, but what little girls doesn't love sequins? 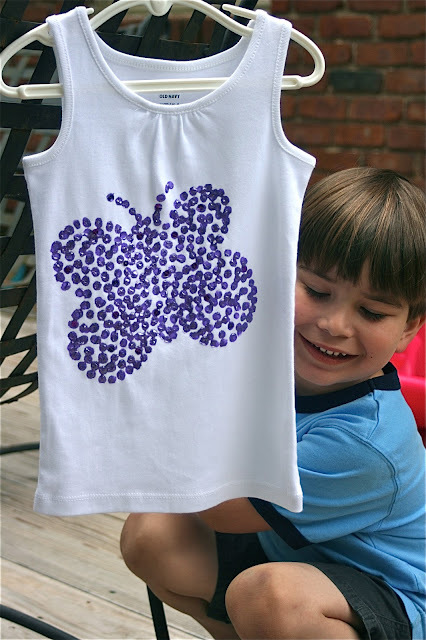 And this way you can control how many sequins are on that new favorite t-shirt), add on another 30 minutes (after the paint has dried). *With every project, I always have at least one thing I would do differently. The only thing I would do different, besides getting metallic puff paint, if getting bigger sequins. I did not even think about it when I picked them up, but bigger would definitely be better! All right, go get some Puff Paint and make your own Faux Sequin t-shirts! Your girls will love them! And you for making it! and we have got the GRUBBY feet to prove it! 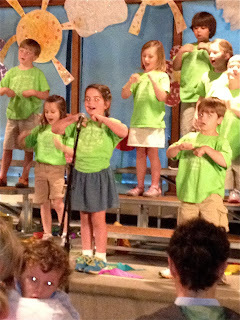 Today was Ella's last day of kindergarten! She looks like (and thinks) she is 6 going on 16! with such sweet, sweet teachers! 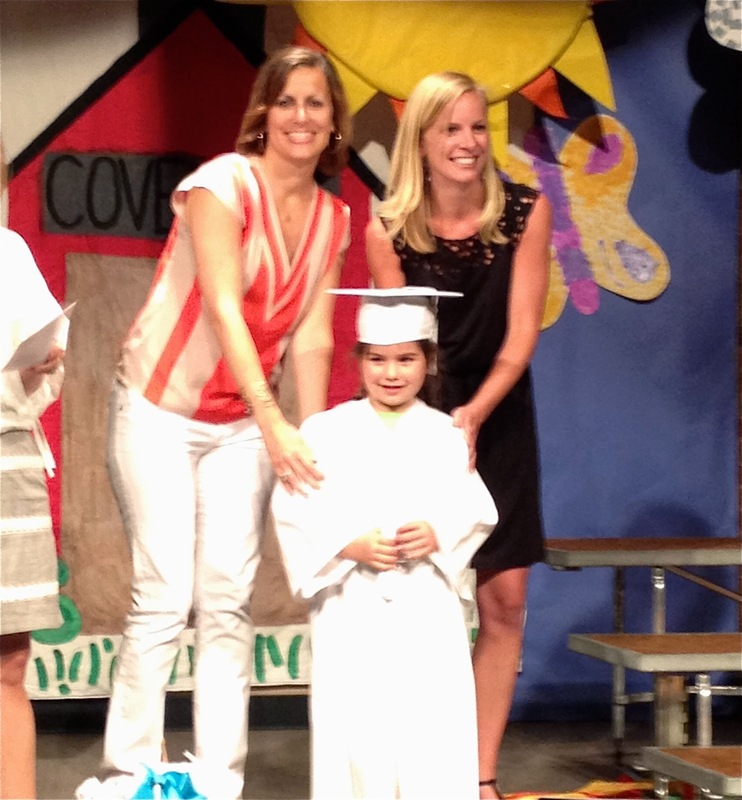 And of course our ViVi! Vivi is their adopted grandmother. She has loved on Ella since she was teeny tiny. 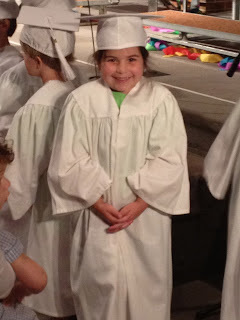 Ella is Vivi's first Covenant baby to graduate and go to "big school." (and suckers) from Miss Tara. 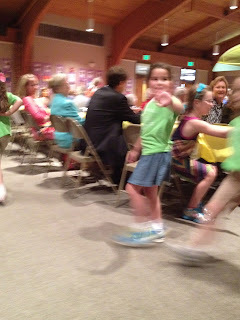 If you ask Sara Wells who her best friend is, every time she will answer "Miss Tara." Tara is moving to LA this summer to be with her beau. Oh we will miss you Miss Tara! This afternoon we headed over to the Baker's to celebrate Ann Tatum's 5 birthday! These kids are growing so fast! 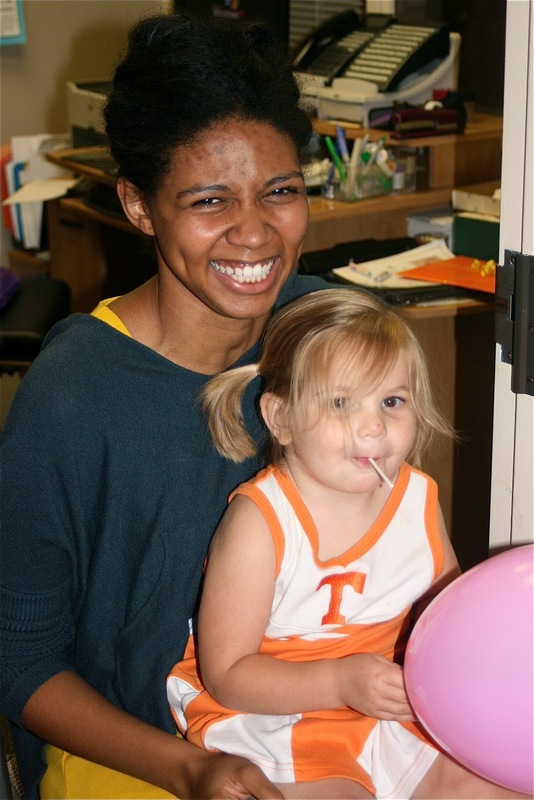 I remember the day she was born just as vivid as when Ella, Miller and Sara Wells were born! 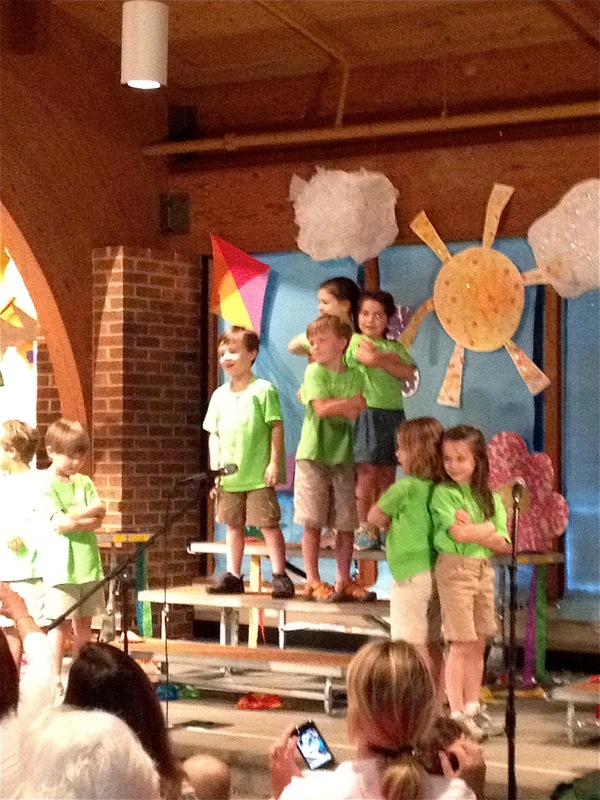 We played all afternoon and evening to the point of major meltdowns, but isn't that what summer is all about? Long afternoons and evenings, spending time together with friends and enjoying not having to be anywhere! Now I know this may be a little late, but I also know everyone has not finished school yet. And if you are like me, you may not have found that perfect gift for your child's teacher that has that extra touch that shows just how special they are to your family. 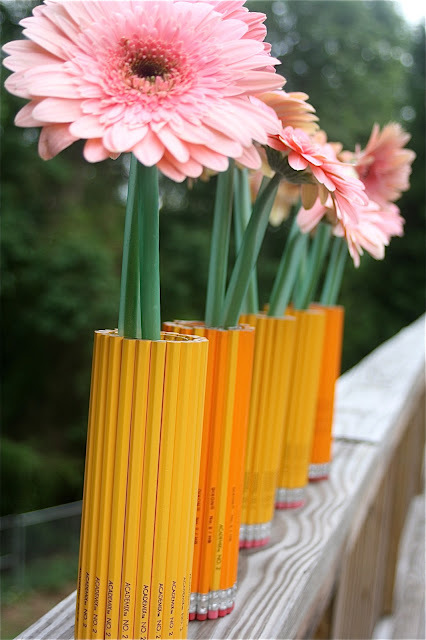 All you need are vases, #2 pencils and your handy dandy glue gun. I got these stem vases at Hobby Lobby and I thought they were the perfect size, but you can use any size. You need lots and lots of pencils (I used around 22 for each vases). 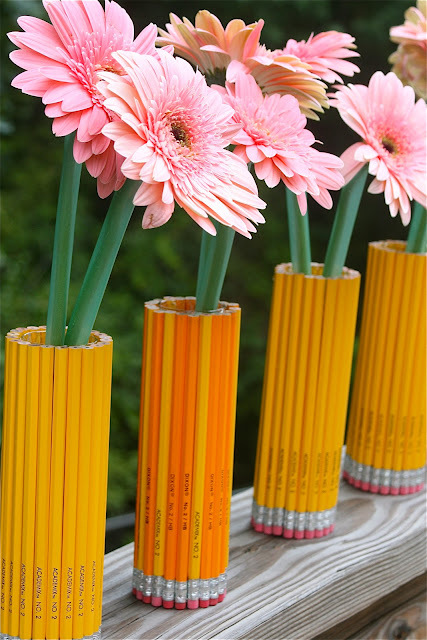 they will find lots of other uses for the pencils and vases! Then you just hot glue the pencils to the vase. It is really that easy! 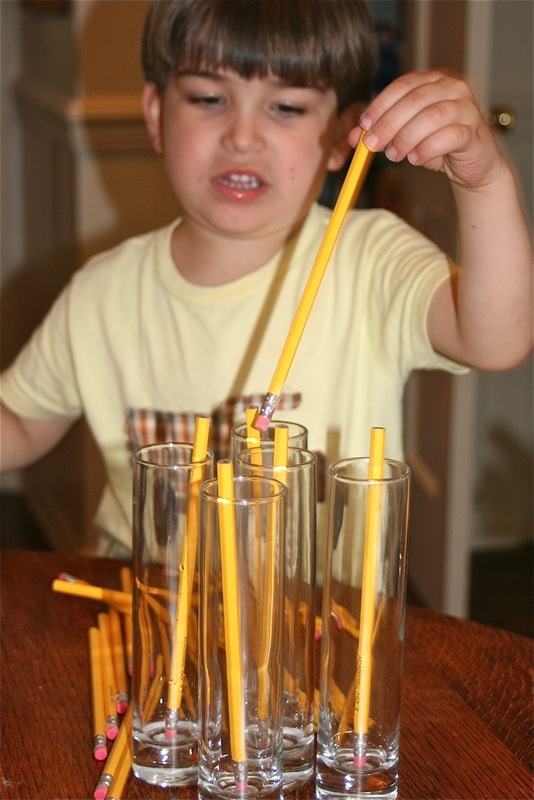 I found it worked best when applying the glue to the vase. 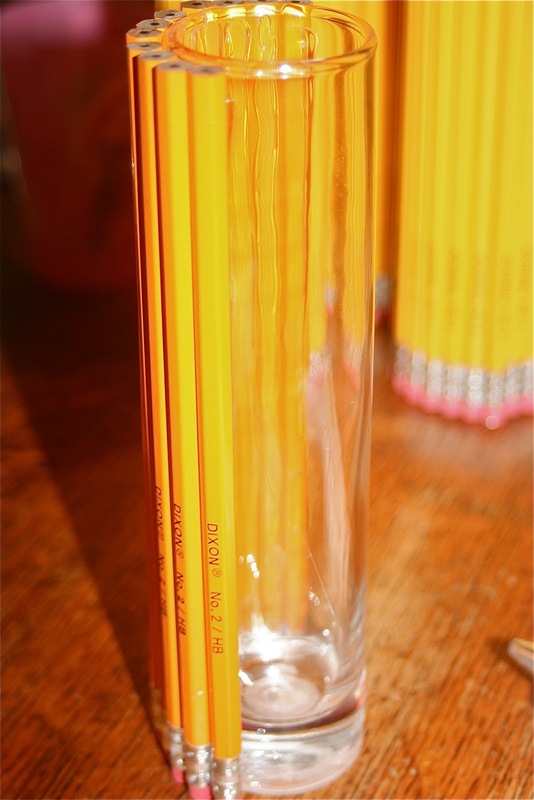 For some reason when I put the glue on the pencil and then the pencil on the glass vase, it did not adhere. But when I put the glue directly on the vase, the pencil always stayed. I have no clue why. And you will have a gift that keeps your favorite teachers smiling all year long! UPDATE: Murray wants you all to know that Sara Wells is NOT a Tennessee fan (honestly, she might be the biggest Alabama fan in the fam). My mom gave this outfit to Ella when she was a baby. Murray almost burned it, but figured relationships were more important than football teams (just barely) so he allowed the cheerleader outfit to stay. But somehow, this outfit is always a favorite. So for the record, it has nothing to do with team choice, just comfy cute cheerleader outfit! In the words of Sara Wells, "Woll Tide Woll!" How does he pull things like this over on me? Usually I do not have a problem sticking to my guns. Spider-Man Pop-Tarts, how can I say no? I am sure the people in the cereal aisle got a big kick out of watching me walk up and down the aisle comparing sugars in each cereal and then without hesitation plop the Pop-Tarts right into the shopping cart. 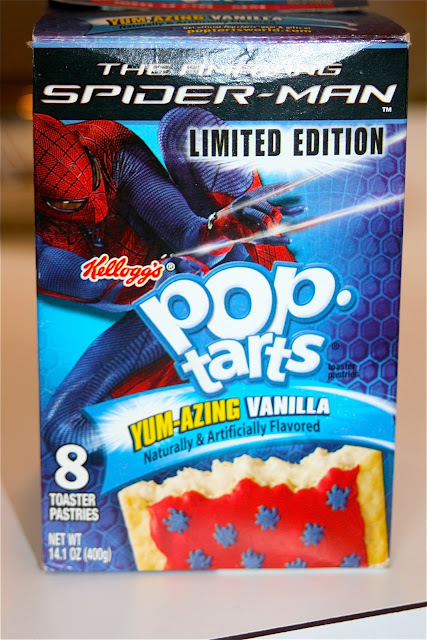 Oh well, maybe that low sugar cereal will balance the loads and loads of sugar in the super cool red and blue Spider-Man Pop-Tarts! 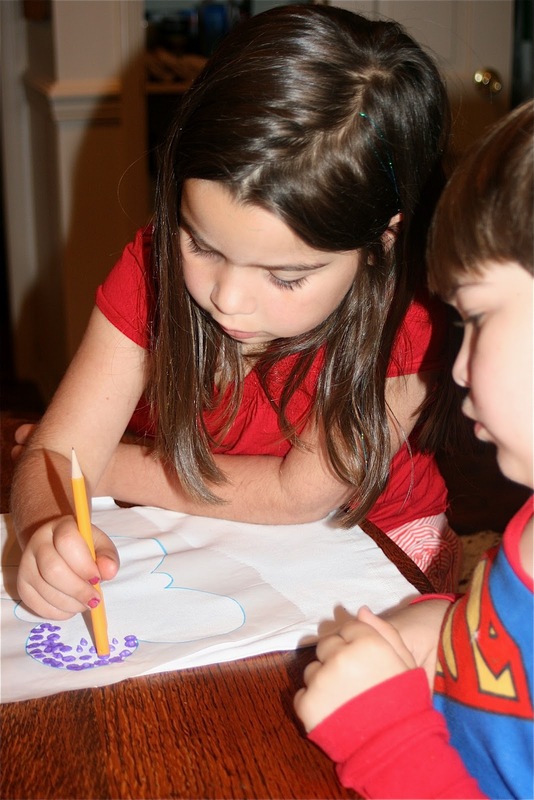 Ok, I am not ashamed to admit it, I am one of those moms that pulls out the workbooks for the kids to work through during the summer. We have tried several different workbooks, but the one that Ella did last summer was far and away the best we have tried! 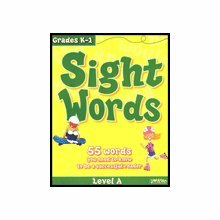 Flash Kids Sight Words Level A Workbook was perfect for Ella entering into Kindergarten. You can order it here or get it from Barnes and Noble. Before we started the book, I thought Ella would fly through the book and we would be onto the next workbook in a month. My expectations were a little off...she barely made it through the book by the end of the summer. We worked through two pages a day, made flash cards for the new words and then worked through all the flash cards of the words she already knew. At times I just wanted to give up and throw the book away. I think she wanted to throw it away everyday! But we both persevered (it took lots and lots of Starbursts and the promise of a pedicure when she finished) and I really think this book is what helped lay the foundation for Ella learning to read. Although pulling teeth might have been easier, every time we went through her flash cards, Ella was so proud of herself for knowing all these new words! 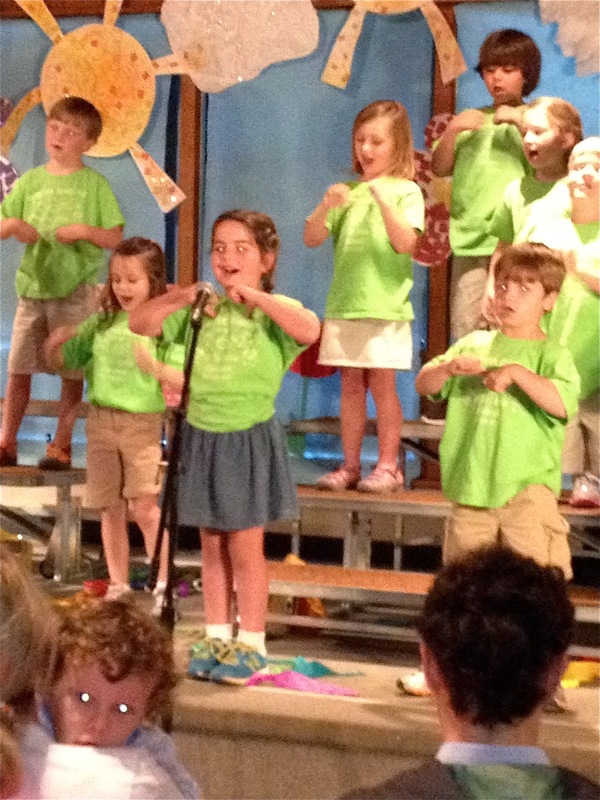 As summer is approaching (Ella and Miller's last day of school is Wednesday!) I just thought I would share this little tid-bit of information with you just in case you are trying to get prepared for summer. I will be heading to Barnes and Nobel this week to pick up the next level for Ella to start working through this summer. It looks like a bigger deal than it is. 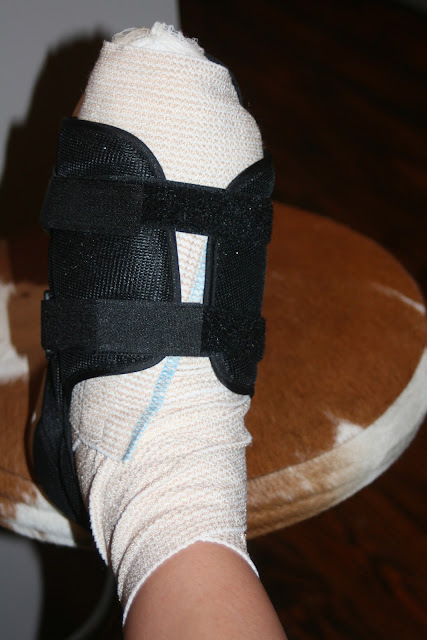 I had a bone spur on my big toe that has been causing a lot of pain since before Christmas. When we finally found it what was causing all the pain, we knew the only thing to do was to have it taken out. However now Murray is accusing me of the timing. Just happens to coincide perfectly with Mother's Day. While I did not plan this surgery around Mother's Day, I have definitely been waited on by everyone and treated with extra special care! Question 3: She like to "go to the eye doctor because there is an extra bone in her foot." The kids always come home with the sweetest things for Mother's Day from school. I always look forward to what they are going to bring home. Between Ella's graduation and my surgery, I just completely forgot about the surprises they might be bringing home. 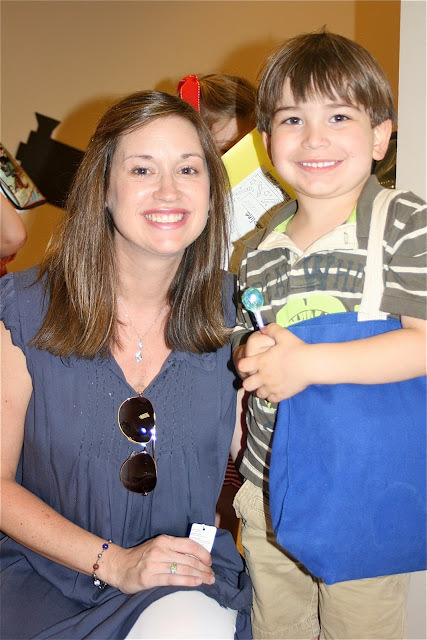 "My Mommy is special because she makes my dinner." The plan for surgery day was Murray was going to drop me off at the hospital and his mom was going to pick me up (Murray felt really bad about not staying with me, but someone had to stay with Sara Wells and pick Ella and Miller up from school and the surgery really was not a big deal, so he dropped me off). The kids, Ella especially, were not happy about leaving me at the hospital. Evidently things went a little faster than expected and Murray was able to pick me up right after he dropped off the kids. It took the nurses a little while to gather all of my things, so the kids got a little antsy in the car. 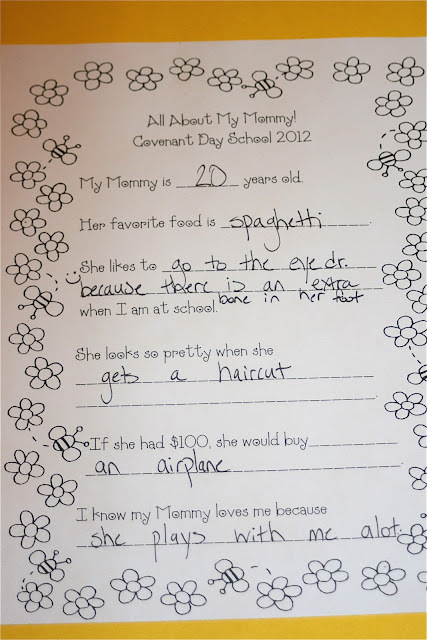 "I like it when my Mommy cooks spaghetti." 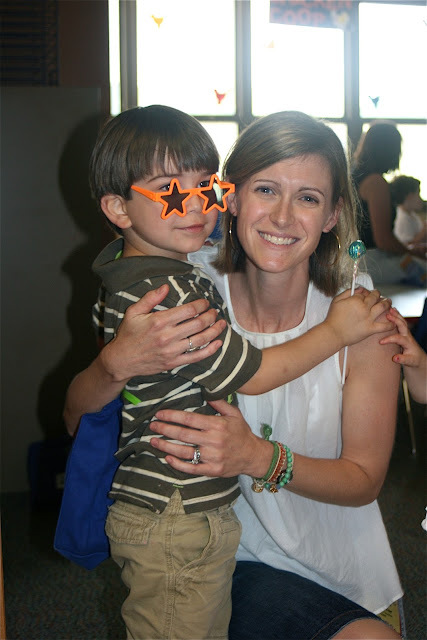 By the time the nurses wheeled me to the car, the kids could no longer contain their excitement to have mommy back! As soon as they saw me they jumped out of their seats to the front seat and shoved their presents in my lap. I was very excited to see them, but also very loopy from whatever I was given to not feel the pain. So it took me a minute to figure out what had just been shoved in my lap with such excitement. "I love my Mommy more than my friends." But I would go through it all again to get these precious, priceless gifts from the sweetest, most precious children who were so concerned about my surgery and so happy to have me back with them (although I was only away while they were at school). "Thank you Mommy for the flower shirt." I will admit that sometimes a lot of times this motherhood thing is very hard and very exhausting! But when I see their little faces so excited that they have done something for me, their Mommy who always takes care of them and always does things for them, I realize I am doing exactly what I am supposed to be doing. I realize how lucky I am to be their Mom! God chose me to be their Mom! All the little things just melt away and I am filled with the sweetness of their unconditional love that is overflowing. Today was a big day at the Lee House! and let their "little light" shine! 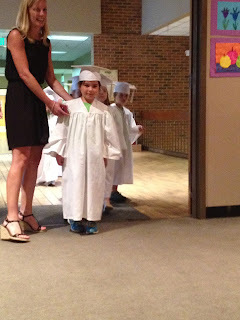 Mommy shed a few (ok, a lot) of tears! 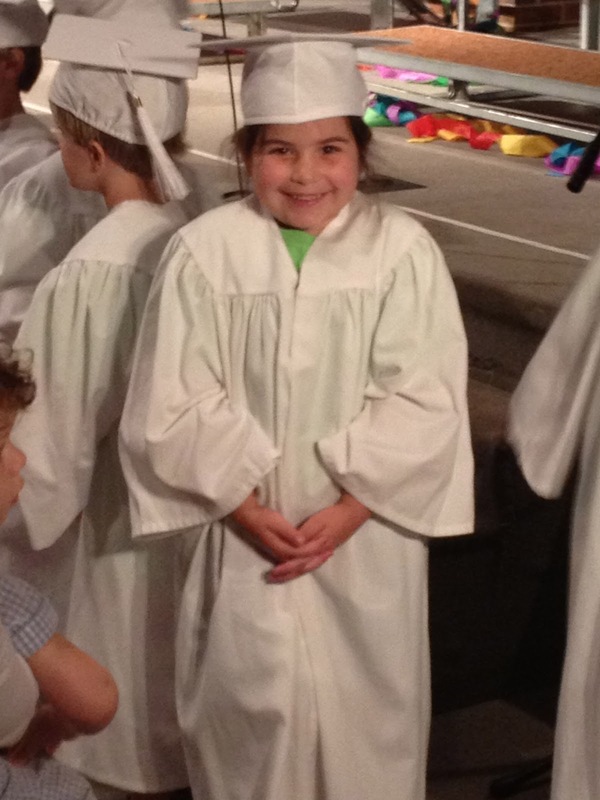 Ella, we love you and are SO proud of you!!! **After I took one picture this morning, my camera died!!! Uggggh! I still have not quite gotten over it, but there is nothing I can do. I remember one Christmas, we had to redo Christmas because my mom forgot to put film in the camera. 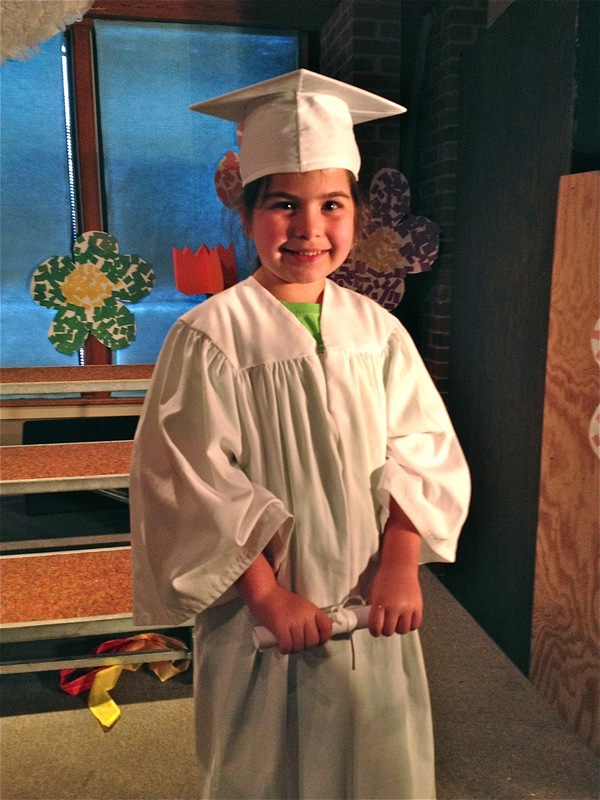 I don't think I am going to be able to convince everyone to redo graduation. Thank goodness for camera phones! 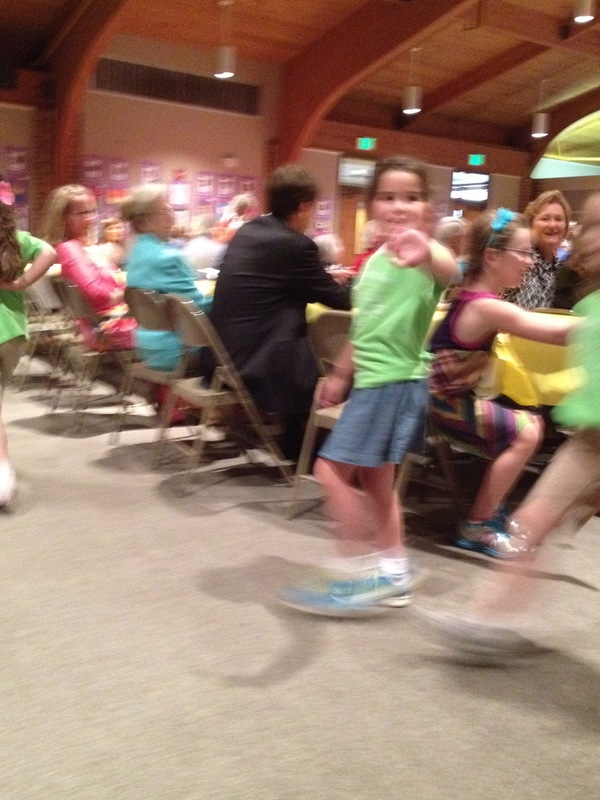 They are not the best pictures, but at least they are pictures.